This review is based strictly on my opinion. I was provided samples free of charge by Oriental Trading to provide my honest review. No other type of compensation was received. All ideas and opinions are my own. One of my favorite Fall activities is to head out to a local apple orchard with my family for apple picking. 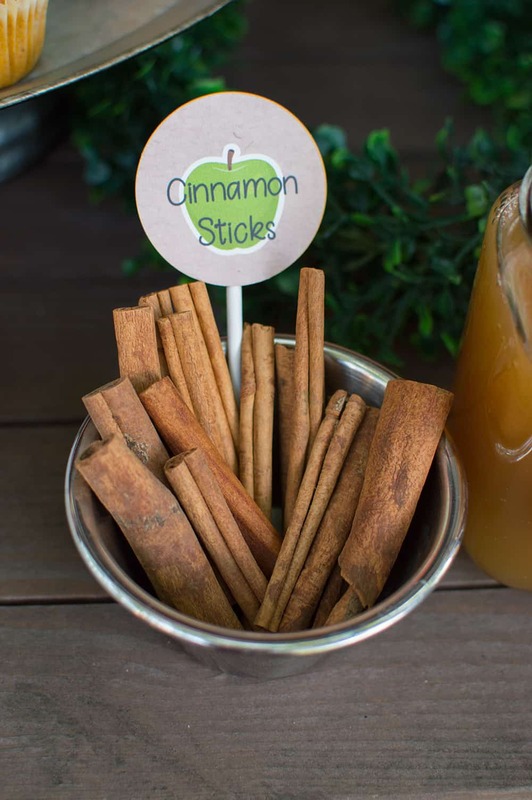 Today I’m sharing this DIY Fall Apple Cider Bar, with tips so you can style your own party at home, full of refreshing sips and sweet treats. 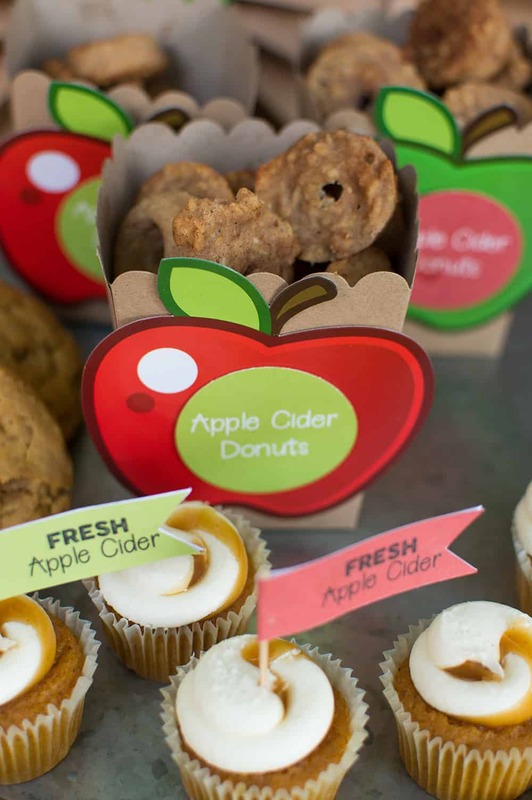 This year we went to Afton Apple in Hastings, MN. We picked a beautiful weekend to go, and it was busy with a line of cars stretching onto the street. But soon enough we were parked and on our way into the orchard. We usually enjoy lunch at the orchard and try out all of the family activities, including petting the animals. But our favorite part is taking the tractor hay ride out to the orchard to pick a peck or two. 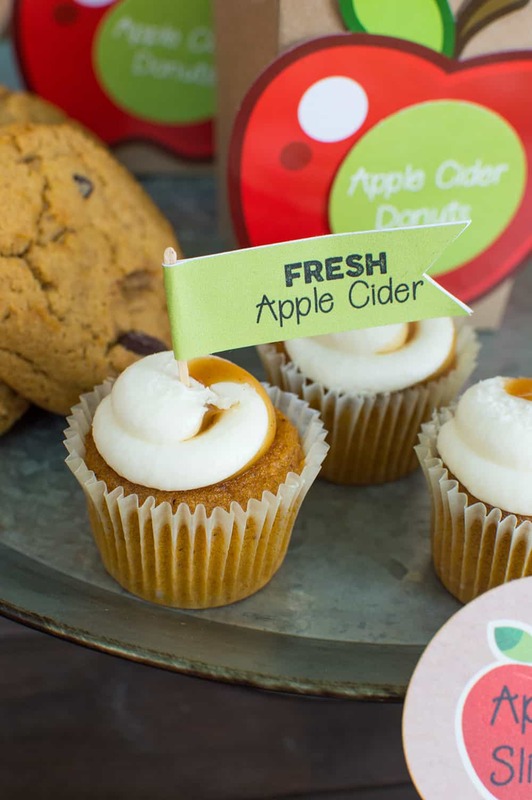 There’s something so fun about picking your own apples straight from the tree and then going home to bake a sweet treat. We always grab some apple cider from the orchard store to take home too. 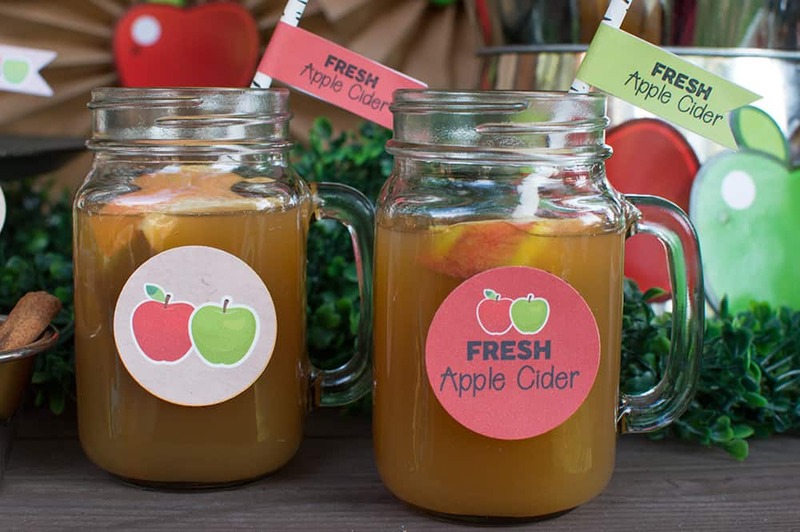 I knew that I wanted to host a small gathering to sip on some fresh cider and enjoy some delicious sweet treats. There’s something wonderful about being outside in October. The crisp Fall sweater weather and crunchy leaves always puts me in a good mood. 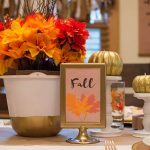 I chose to decorate my planting table, which you’ve seen before here and here, with traditional apple colors, galvanized metal, a little greenery, and natural kraft. 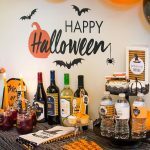 I turned to one of my favorite retailers, Oriental Trading, for the perfect party supplies for my event. 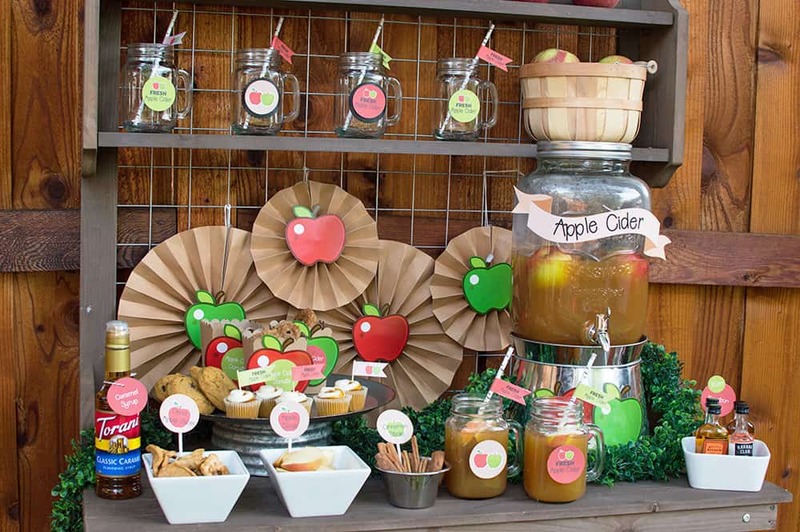 I wanted apples to be the highlight of my cider bar table, so when I started my search for decorations and saw these apple cutouts I knew they would be perfect. Using only the red and green colors, they ended up being the basis for my printables. 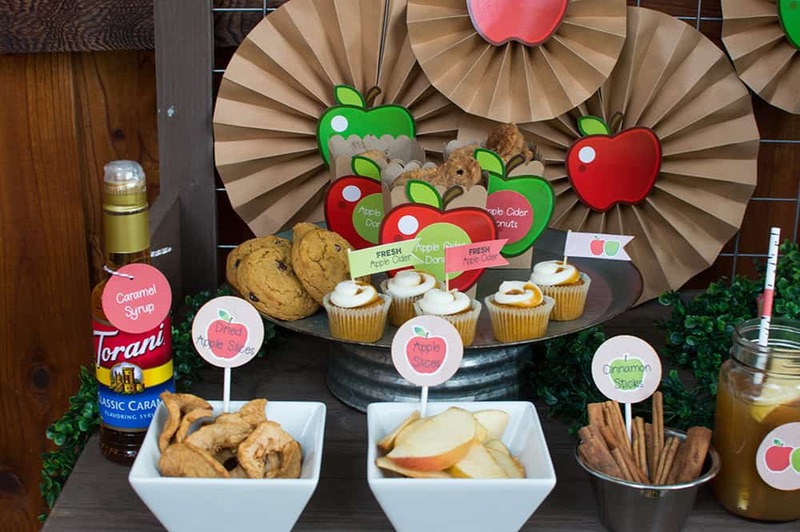 Pairing the apple cutouts against kraft created a pop of color that looks great. These kraft paper fans created an easy backdrop, which I simply attached to the metal grate area of my potting table. Simply use a glue dot to attach the apple cutout to each fan. I also attached some apple cutouts to these mini kraft popcorn boxes. These are so versatile and can be used for far more than just popcorn. 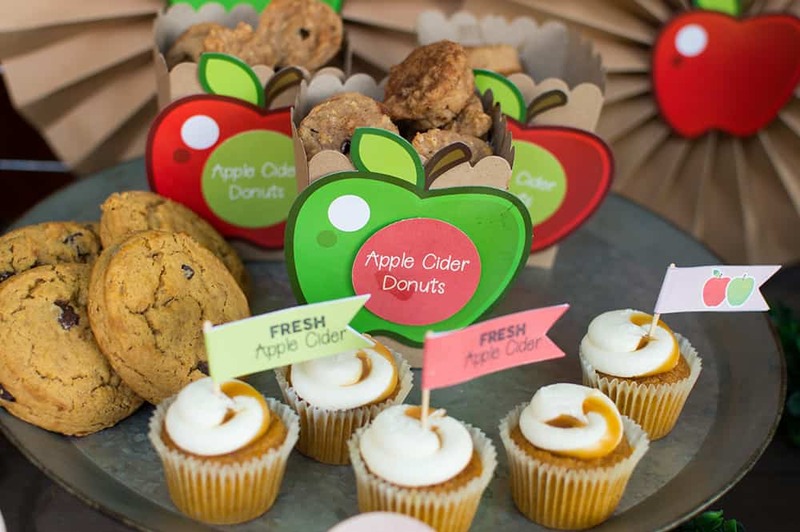 I wanted to keep my treats more on the sweet than savory side, and had a special plan for these boxes: apple cider donuts. This was my first time making mini donuts, and while the shape is not quite a donut shape, they were so tasty. I will keep working on perfecting these! Nonetheless, the mini donuts looked so cute packaged up this way. 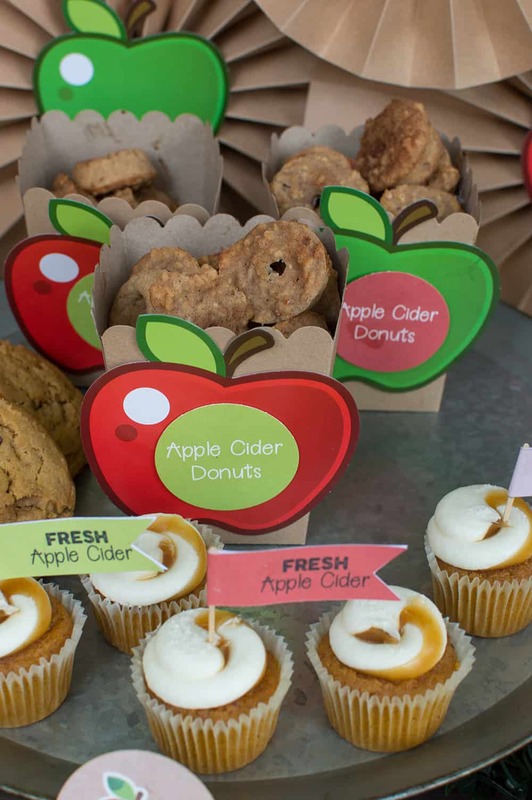 Other treats included little pumpkin cupcakes and pumpkin chocolate chip cookies. Yum! I used the straw flags I created for little cupcake toppers and placed everything on a galvanized metal cake stand. 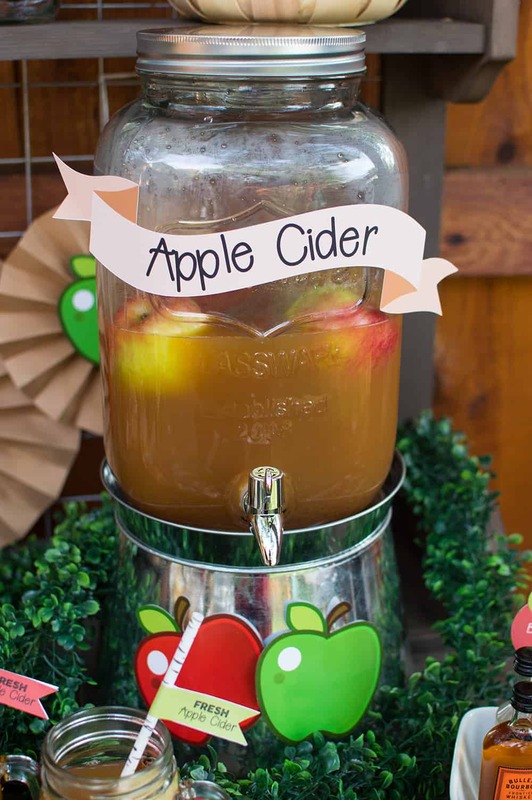 One of my favorite features of this Fall Apple Cider Bar is the apple cider itself. 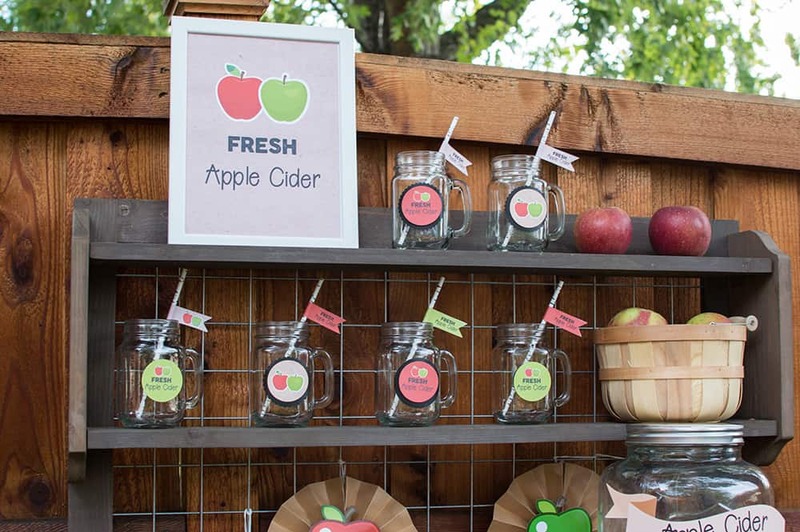 Oriental Trading has a fabulous mason jar drink dispenser that sits atop a little metal stand. Inside the dispenser I included a few apples. I love this small and easy detail! Using my Silhouette Cameo, I made a little ribbon banner to attach to the mason jar. Don’t forget, you can download this banner to use at your own party. I love how this boxwood garland provides an amazing pop of green! 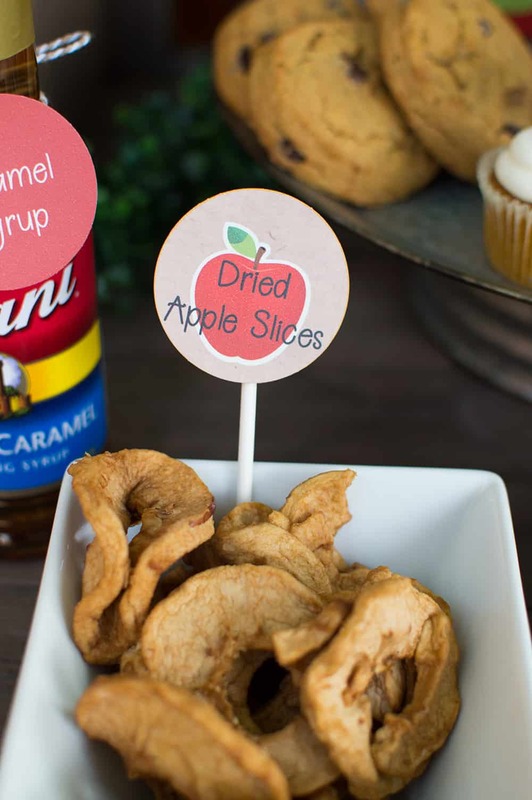 I offered an array of ingredients to top off the drinks, including fresh apple slices, dried apple slices, cinnamon, and caramel syrup. 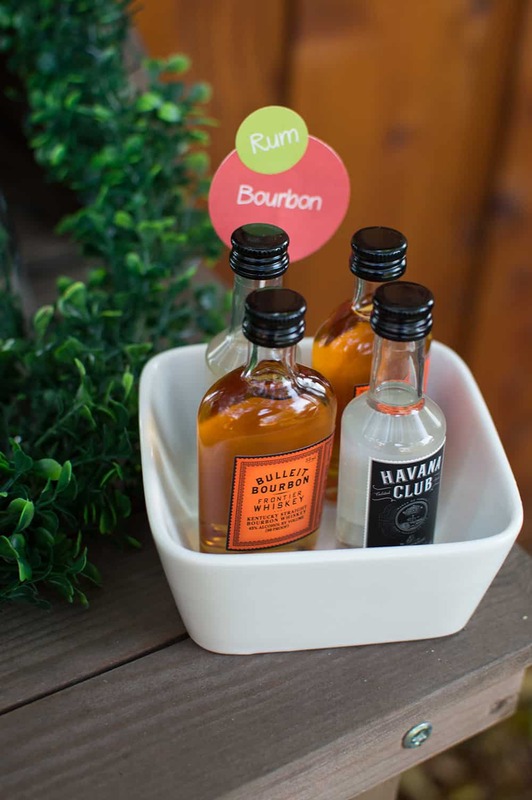 Adults had the option to add an extra boozy ingredient to their drink. 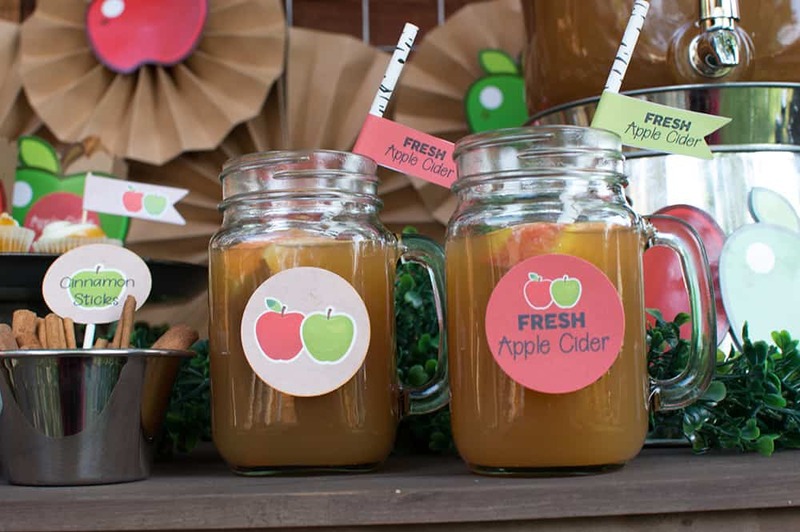 The cider and ingredients all went into mason jars, adorned with little tags and topped with a paper straw, which of course had a straw flag! I used the extra mason jars to complete the decorations on the top shelves. 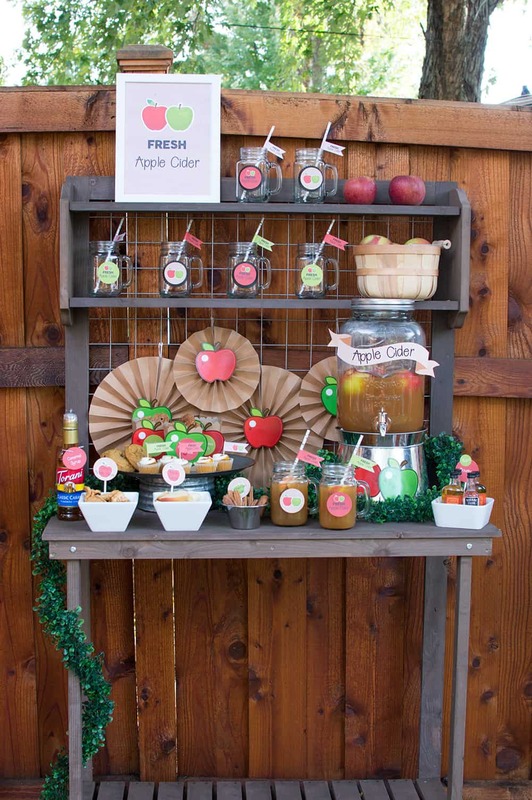 Add in a basket of apples and a party sign, and the look is complete. 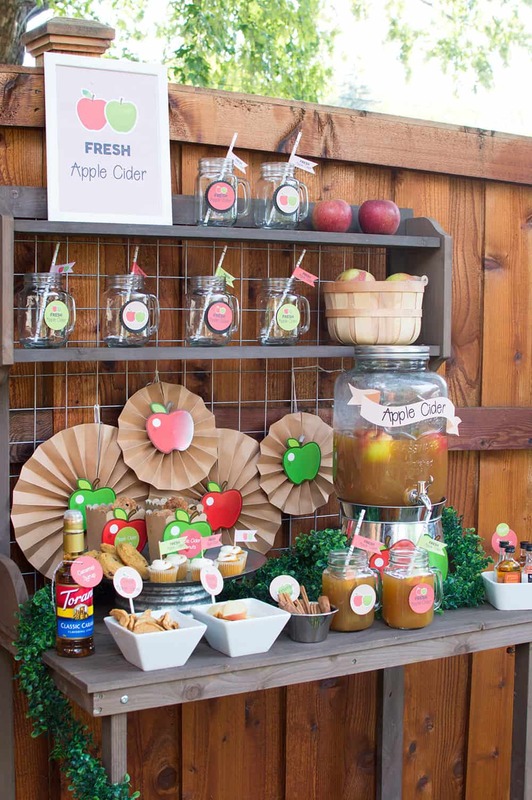 I love how everything came together with this Fall Apple Cider Bar! Mason Jars: I picked these up at a bridal consignment store but you can find a set of mason jar drinking glasses on Amazon or get some from The Dollar Tree.